The past 35 years have seen Shenzhen transition from a poor fishing village to a modern metropolis. Today, it is one of China’s most important economic centers and the frontier of China’s gem and jewelry industry. Photo ©Istockphoto. 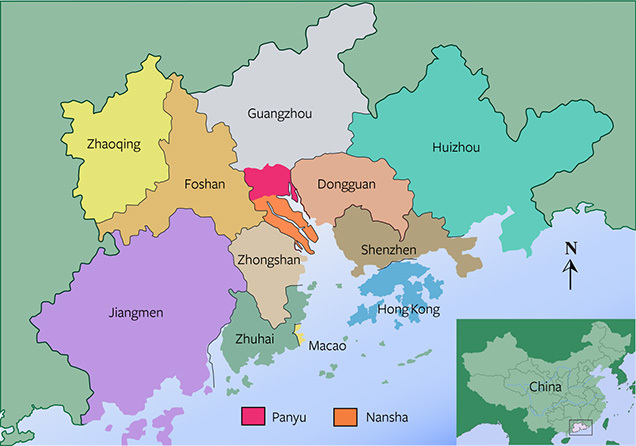 Shenzhen is located at the southern tip of the Pearl River Delta, bordering Hong Kong. 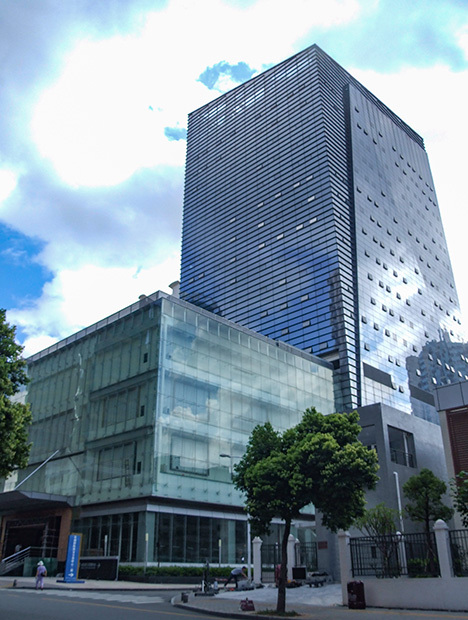 Exchange Center. Courtesy China Gems Magazine. The city’s GDP rose from 1.96 million Chinese renminbi (RMB) in 1979 to 1,600.20 billion RMB (US $267 billion) in 2013. The growth rate in Gross Domestic Product was 8.8 percent from 2013 to 2014, which was higher than the overall growth rate for all of China. This fast growth attracted new migrants from all over the country and the world. The permanent population grew from 30,000 in the early 1980s to about 18 million today. Its demographic consists of 99 percent migrants, although the exact population has never been consistent or easy to count. Shenzhen. Courtesy China Gems Magazine. Besides being home to numerous high-tech companies, the Shenzhen Stock Exchange, and the world’s third-busiest container port, Shenzhen is also at the forefront of China’s gem and jewelry industry. There are more than 3,600 registered jewelry companies, more than 5,000 licensed individual dealers, and 29 gem and jewelry exchange centers in Shenzhen. The industry employs more than 150,000 people. The value of total wholesale jewelry production and the total domestic jewelry retail sales in Shenzhen reached 100 billion RMB (about US $16.7 billion) and 140 billion RMB (about $23.3 billion) respectively in 2014. In 2013, a group from GIA visited China to research the Chinese industry and market. During that visit, the team observed many of Shenzhen’s leading companies. 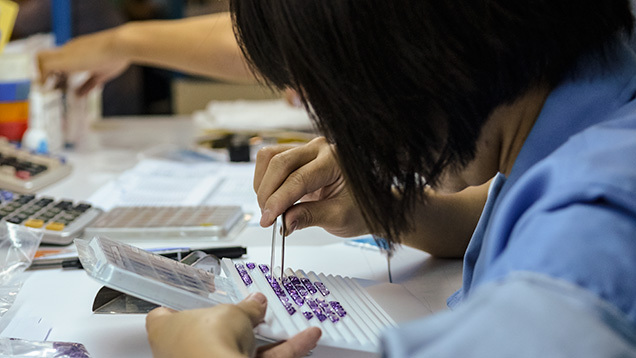 The beginning of Shenzhen’s gem and jewelry industry dates back to the early 1980s, when Hong Kong jewelry manufacturers started moving their factories and plants to mainland China. 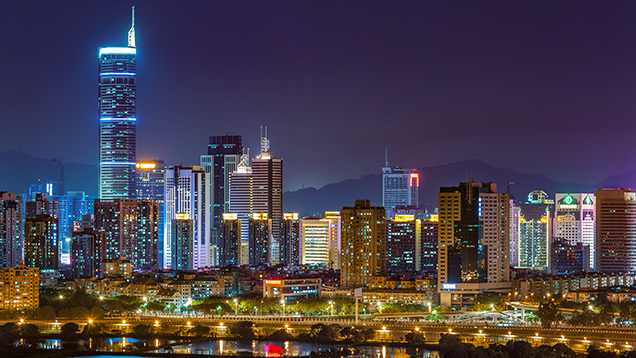 In addition to its ideal location as a neighbor of Hong Kong, Shenzhen’s development was also facilitated when the government started a trial of new gold-trading policy in the city. Before that, between 1949 and 1982, it was required that all gold production be submitted to the central bank, which then distributed the gold to factories. Also, individual consumers were not allowed to purchase gold. 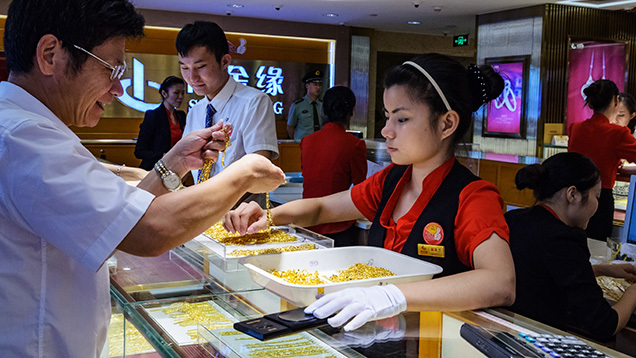 The first stage in the opening up of the gold trade was to allow individuals to purchase gold jewelry in state-owned shopping malls. Since China opened its gold market to individuals, gold jewelry has been a best seller among all jewelry categories. Photo by Andrew Lucas/GIA, courtesy Batar Jewelry. 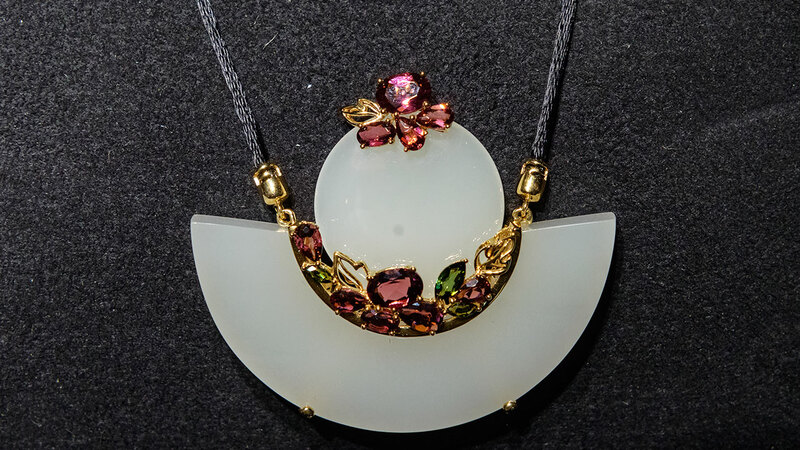 In the 1980s, Shenzhen’s gem and jewelry industry was very small-scale. The main business model was called “three-plus-one,” a custom manufacturing arrangement that used supplied materials, designs, and samples, and—for compensation (the “plus”)—manufactured the desired product. Many industries adopted this model at the beginning of the reform process. The gem and jewelry industry in Shenzhen began with jewelry manufacturing, which is still one of the city’s pillar industries. Courtesy Shenzhen Yuehao Jewelry. The industry experienced its fastest growth between the end of the 1980s and the early 2000s. During that time, gem and jewelry trading policy became more and more flexible and private businesses grew rapidly. Consumers had more and more disposable income to spend on luxury products like jewelry. Shenzhen Gold and Jewelry Association formed in 1990, with support from the local government, to serve as a bridge between government and business owners. 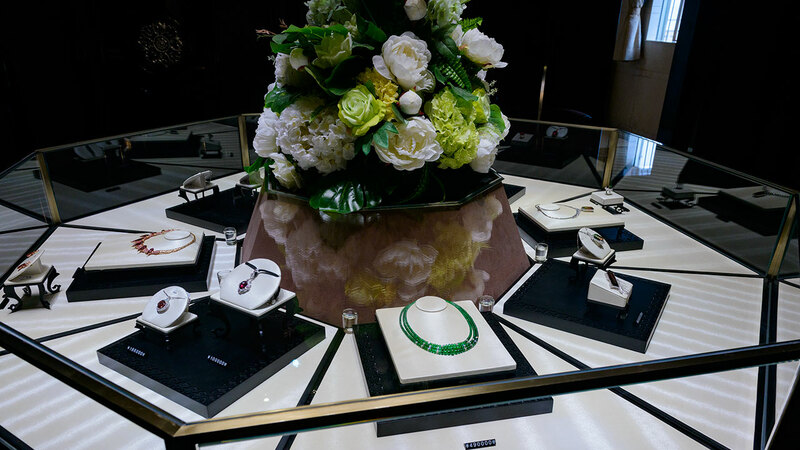 More and more Chinese consumers are spending their disposable income on luxury goods such as jewelry. The fast growth of the Shenzhen gem and jewelry industry is aided by an increase in discretionary income. Photo by Andrew Lucas/GIA, courtesy Enzo. After 2003, the government further reformed its taxation policies in order to support the developing gem and jewelry industry. The formation of gold and diamond exchanges stimulated the fast growth of the industry in multiple areas all over the country. In Shenzhen, larger jewelry companies quickly expanded, and brand building took over as the core mission. 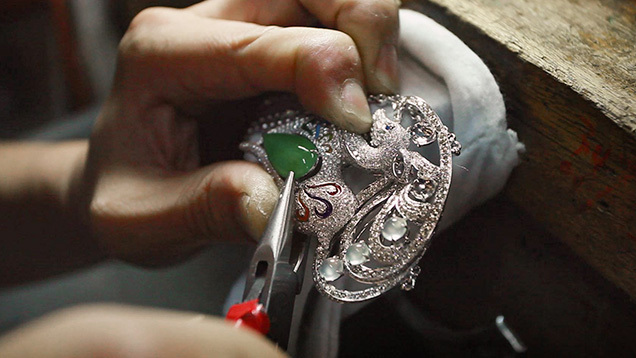 In addition to being a manufacturing and trade center, Shenzhen is also home to most major Chinese jewelry brands. In 2005, several jewelry brands originating in Shenzhen were named “China Famous Brand.” This labeling helped them with brand promotion and sales, and caused many industry participants to realize the importance of brand building. Today, the leading brand in every sector of the gem and jewelry industry has operations in Shenzhen. Enzo, a leading colored stone jewelry brand, is modeled by Chinese movie star Sun Ning. 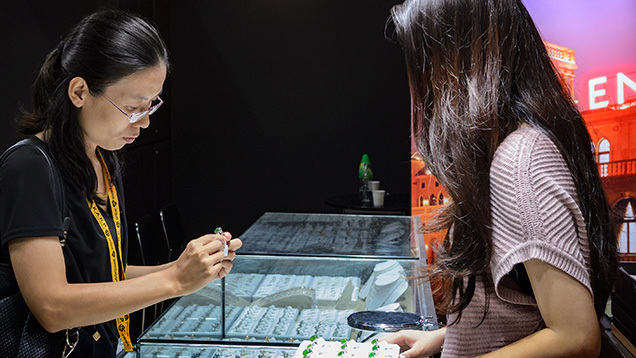 Shuibei Jewelry Park covers an area of less than one square kilometer, but it is the center of Shenzhen’s gem and jewelry industry, encompassing more than 2,000 jewelry companies. Many companies originated there as small studios and became leading industry brands. Most of the area’s gem and jewelry exchange centers are clustered there as well. Gem-testing labs and industry services such as packaging, transport, and storage also have offices in the area. 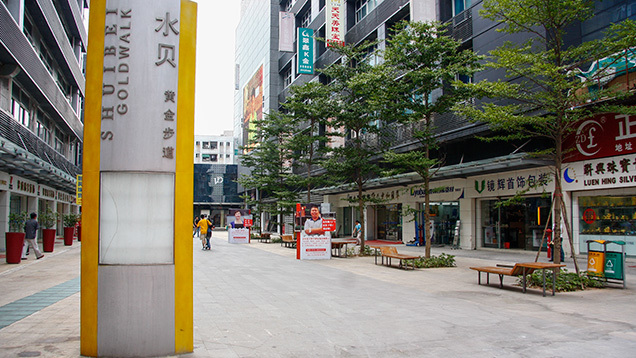 Shuibei is the center of Shenzhen’s gem and jewelry industry. There are over 2,000 jewelry businesses clustered there. Courtesy China Gems Magazine. The GIA team visited two large exchange centers and the largest high-end jewelry club, managed by Shenzhen Creation Group. The Creation Group is one of the leading colored stone companies in Shenzhen. It formed in 2000 and operates a group of companies engaged in high-end and commercial jewelry design and manufacturing, and in gemstone and jewelry trading. 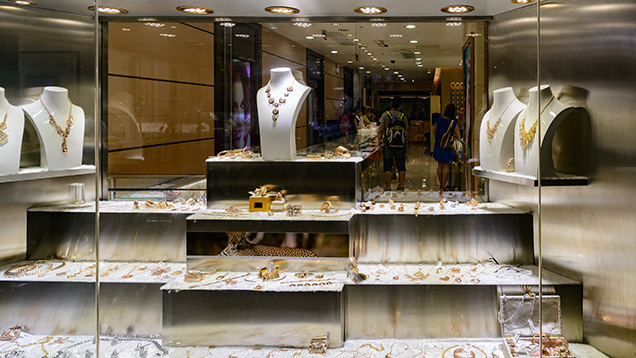 There are more than 100 jewelry shops in the Shuibei International Jewelry Trade Center. 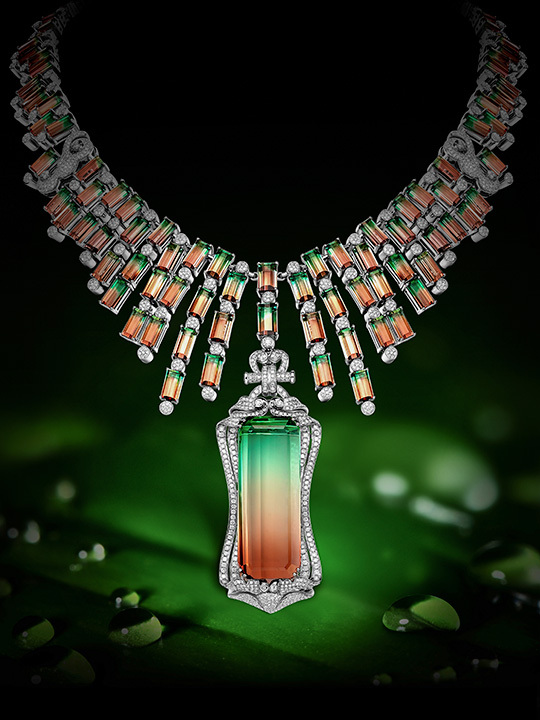 It has four main sectors, including a jadeite jade section. Photo by Eric Welch/GIA, courtesy The Creation Group. The Shuibei International Jewelry Trade Center opened in May, 2004. It was the first centralized jewelry trading platform in Shuibei. Before that, people who wanted to buy wholesale gemstones and jewelry needed to go from one shop to another. This center provided the first one-stop service for large and small wholesalers and retailers. Karat-gold jewelry is very popular in the China market. 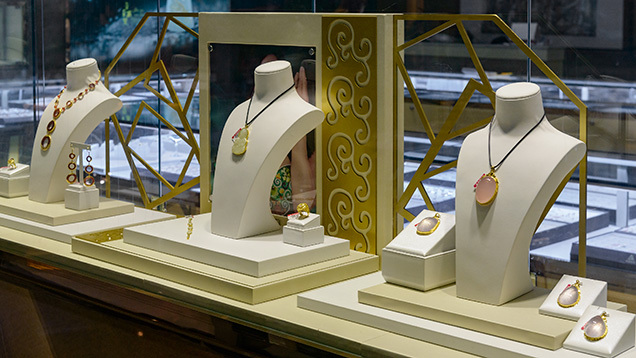 This display promotes the Yuehao jewelry brand, which has a store in the Shuibei International Jewelry Trade Center. Photo by Eric Welch/GIA, courtesy of The Creation Group. The Shuibei International Jewelry Trade Center currently hosts more than 100 notable local and international jewelry shops. 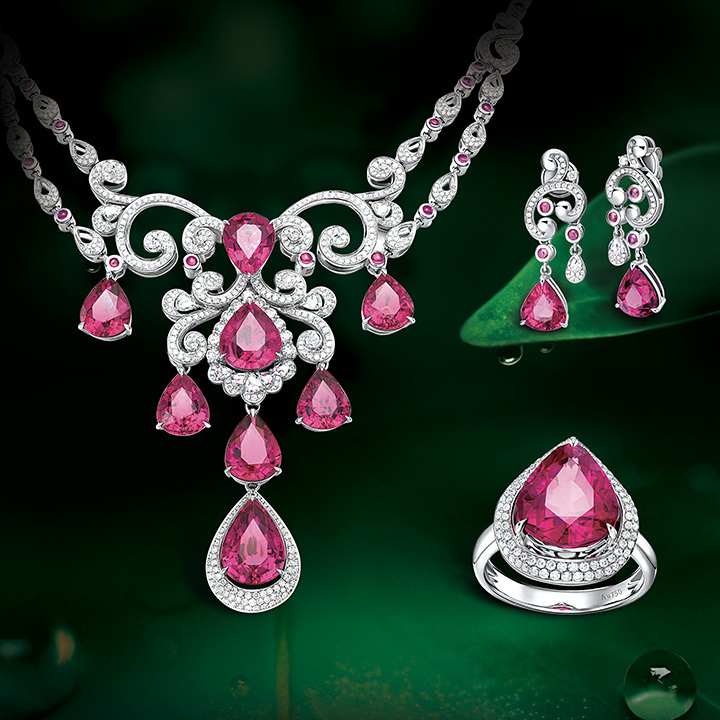 There are four main sectors: brands, jadeite jade, and karat gold and silver jewelry. The company evaluates all dealers at the end of each year. Contract renewals are based on many evaluation factors, including consumer satisfaction. Only qualified dealers can operate their shops or booths in the center. The company also invests in displays designed to educate consumers and reassure them about the center’s reliability. This is especially important today since more and more trading platforms are being built and to be sustainable, owners have to make their facilities stand out. 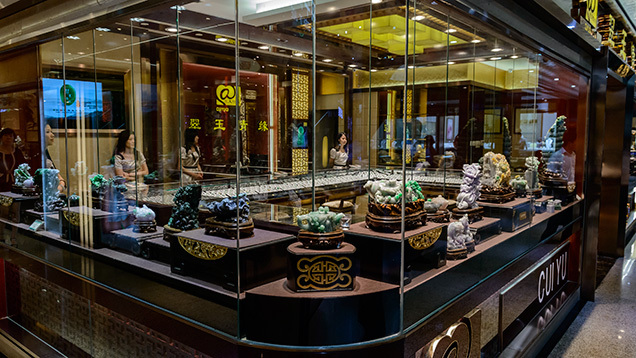 Shops in the exchange centers usually carry gold, jade, colored stone, and diamond jewelry. Wholesalers and retailers can easily find what they want. Photo by Eric Welch/GIA, courtesy The Creation Group. The Royalland Jewelry Club was formed in 2009 to cater to the emerging high-end jewelry market. 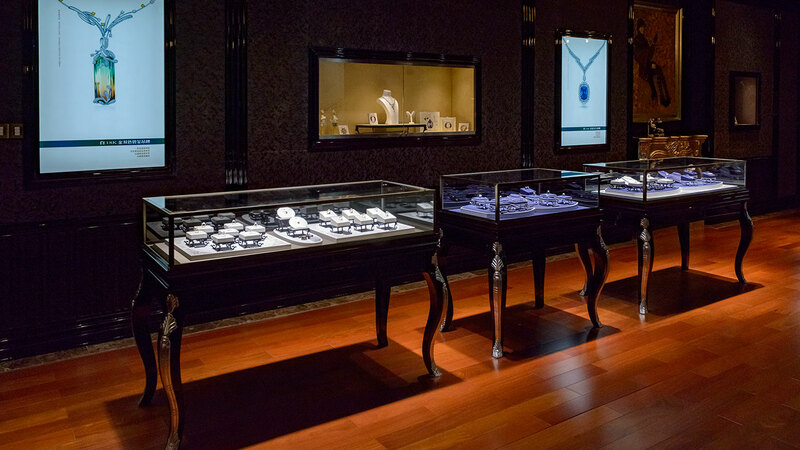 It is the largest high-end jewelry club in mainland China, with a showroom that’s more than 21,500 square feet in size. The showroom is located on the top floor of a building and has its own private access. 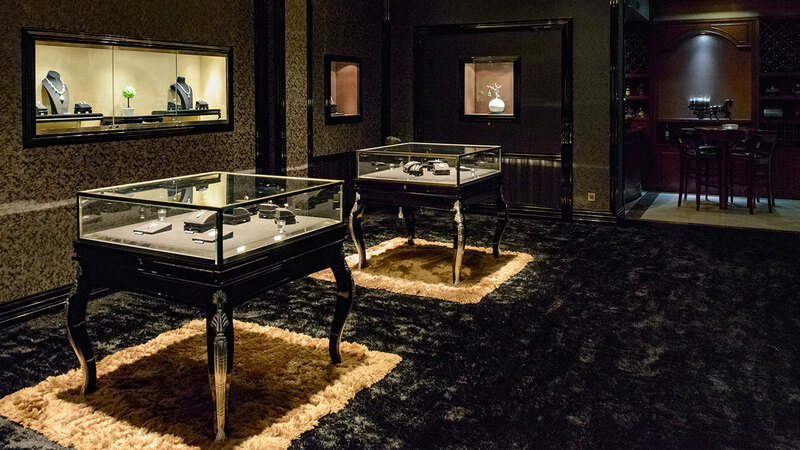 The club regularly hosts jewelry salons for its clients and is also available for private events. Independent designers contract with the club to develop custom designs for luxury consumers. Gold jewelry has a long tradition as a best-seller in China. Batar provides manufacturing services for almost all major gold jewelry brands and produces one out of five gold jewelry pieces in China. The company was registered in Hong Kong in 2001 and is now a member of the Shanghai Gold Exchange. In addition to gold jewelry manufacturing, Batar also deals in other gold products and in gold inheritance and investment. Batar has more than 20 subsidiaries, and sold nearly 200 tons of gold products in 2014. The company is now the main supplier of 24K gold jewelry for more than 30,000 retailers and more than 400 brand names. Twenty-four karat gold jewelry is still the most popular wedding jewelry in China. This suite has a traditional dragon and phoenix theme. Photo by Andrew Lucas/GIA, courtesy Batar Jewelry. Twenty-four karat gold jewelry is favored by Chinese consumers, who feel that the purer the better when it comes to gold. This is unlike other world markets in the world. 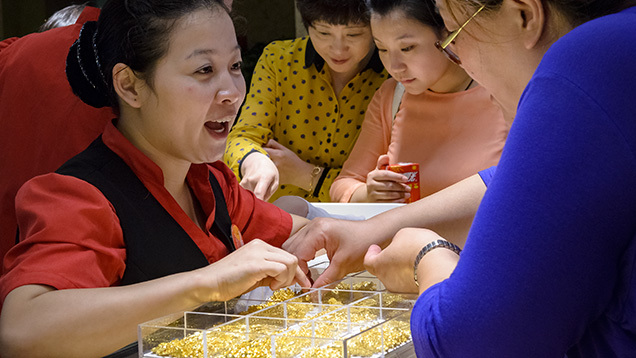 Asian consumers, including those in the Middle East, are generally gold lovers, but the highest gold purity commonly found in those markets is 22K (91.6 percent gold). The Batar store is always packed with gold jewelry shoppers. The Chinese people have a never-ending passion for high-purity gold jewelry. Photo by Andrew Lucas/GIA, courtesy Batar Jewelry. 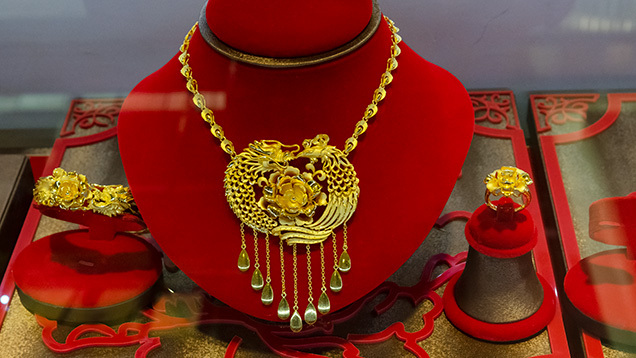 It is Chinese tradition to purchase gold jewelry as gifts for important life events. At the beginning of each lunar year, consumers buy all kinds of gold bars or decorations with designs featuring that year’s zodiac animal. Every holiday, stores that carry gold jewelry are packed with wealthy families and entrepreneurs who buy large gold decorative items to show off their success. Also, increasing numbers of individual consumers invest their increasing discretionary income in gold and gemstones. Batar took advantage of this opportunity by collaborating with banks to facilitate their gold investment programs. Batar is the main supplier for gold jewelry retailers from all over the country. Each transaction usually involves large amounts of gold jewelry, which explains the need for these baskets to hold the selected goods. Photo by Andrew Lucas/GIA, courtesy Batar Jewelry. When GIA visited a Batar store in Shenzhen on a regular business day, the store was crowded with clients. Based on the quantity of goods they were purchasing, it was easy to tell that most of them were wholesalers and retailers. Large quantities of gold jewelry were collected in baskets during the transactions, and the salespeople and buyers were busy counting and selecting items. 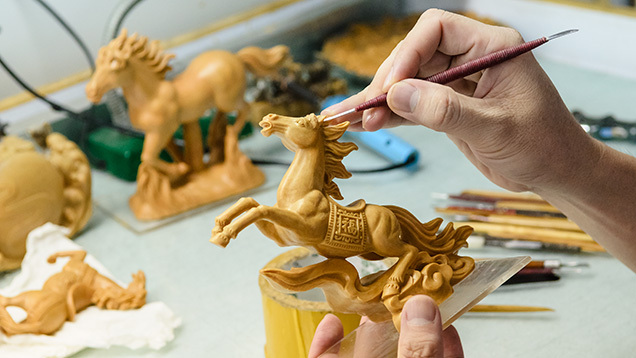 Batar employs the top wax carvers in the industry, and they pay a lot of attention to detail. This carver is working on the original wax model for a gold ornamental object. Photo by Andrew Lucas/GIA, courtesy Batar Jewelry. Batar started as a manufacturer for jewelry brands outside of China. When the domestic Chinese gold market opened up, the company became the main manufacturer for domestic jewelry brands as well. Later, Batar developed its own brands, including Batar Jewelry and Show King. The company has contracts with well-known jewelry designers and never stops inventing new techniques and designs. Batar is a major manufacturer of gold jewelry and ornamental objects. Photo by Andrew Lucas/GIA, courtesy Batar Jewelry. To satisfy the demand for high-purity gold jewelry, the company invested in developing new gold jewelry manufacturing techniques in collaboration with China Science Academy. 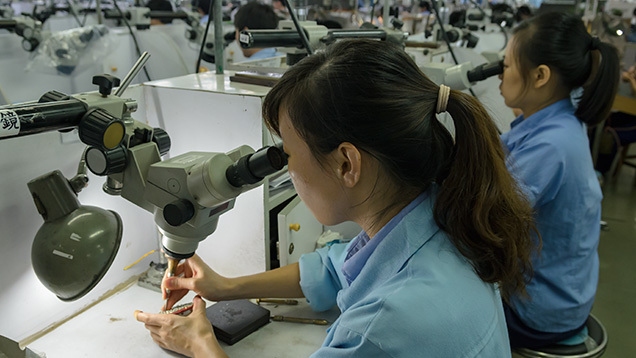 As all goldsmiths know, soldering is one of most important steps in making gold jewelry, but the standard solder used in China contains only 91.6 percent gold, giving it a lower melting temperature than pure gold. 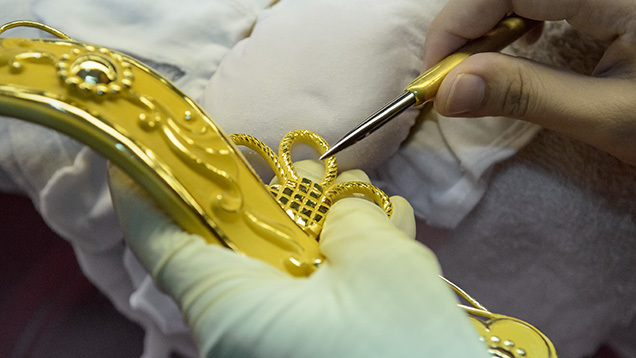 In order to significantly improve the purity of gold items, they must use 24K material throughout the process and also try to avoid as many soldering steps as possible. This is the key technique that Batar uses to stay competitive. To cater to young consumers, Batar developed techniques to make gold jewelry reflect different colors of light. While the result is popular with young consumers, the older generation still prefers the traditional designs and pays more attention to the value of the material than to its unique appearance. A recent market survey indicated that of all 24K jewelry, chains—necklaces and bracelets—are the best sellers. Sales of gold chains account for 40 percent of the market, with rings at 17 percent and pendants at 11 percent. Batar manufactures massive quantities of 24K gold jewelry and ornamental objects. The recipient of the 2014 JNA Manufacturer of the Year award for gem-set jewelry, Shenzhen’s Xingguangda Jewelry Industrial Co. Ltd., is one of the leading jewelry manufacturers in mainland China. 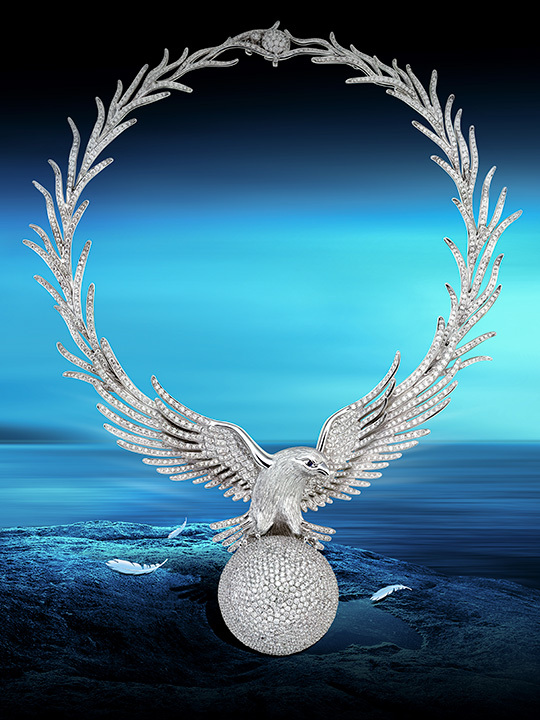 The company was formed in 1997 and specializes in gemstone jewelry in 18-karat gold and platinum. In addition, Xingguangda also engages in jewelry design, manufacturing technique research, and jewelry wholesale and retail. 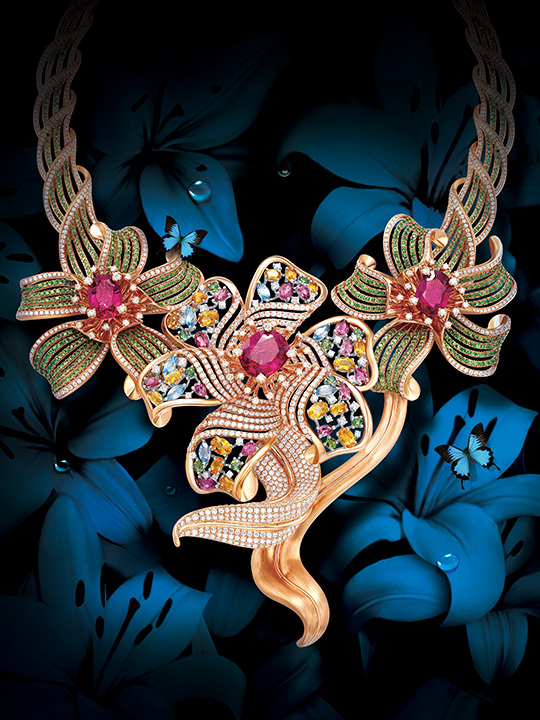 Xingguangda is one of China’s leading jewelry manufacturers. 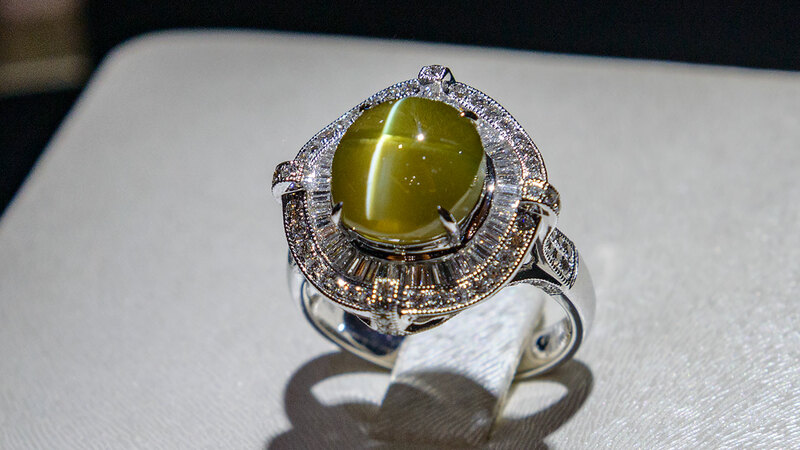 Its gem-setting techniques are very well known throughout the industry. 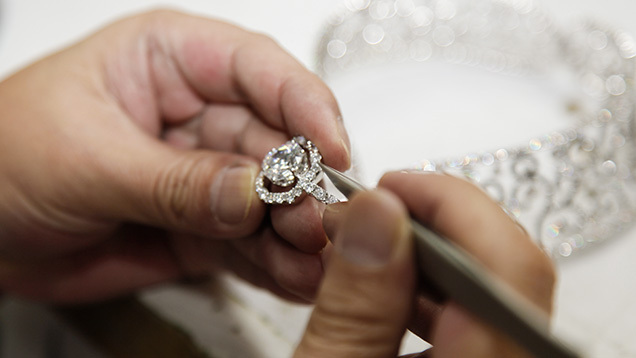 This worker is making the final adjustments on a high-end diamond jewelry suite. Courtesy Xingguangda Jewelry. After more than 20 years of operation, Xingguangda now owns four well-known jewelry brands, more than 50 patents, and more than 3,000 retail outlets countrywide. Working closely with the China Gem and Jewelry Industry Association, the company has been involved in the formalization of multiple industry standards. 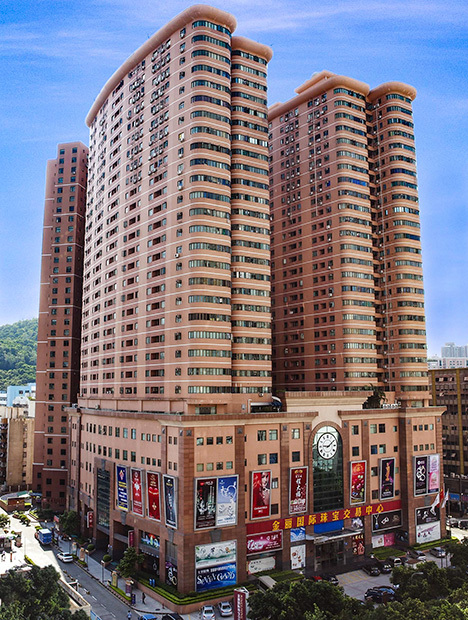 Xingguangda had its origins in Shenzhen, and has built a very solid base in this world-class industry hub. The company’s core team includes its management staff and more than 1,000 professional technicians. 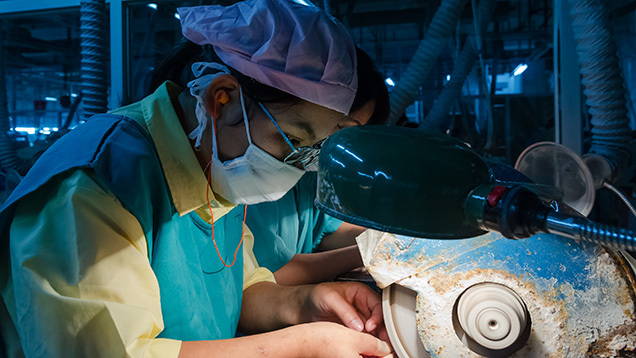 Manufacturing in Shenzhen is almost always done on a large scale and this is no different at Xingguanda, where large quantities of diamonds are set into the jewelry they produce. 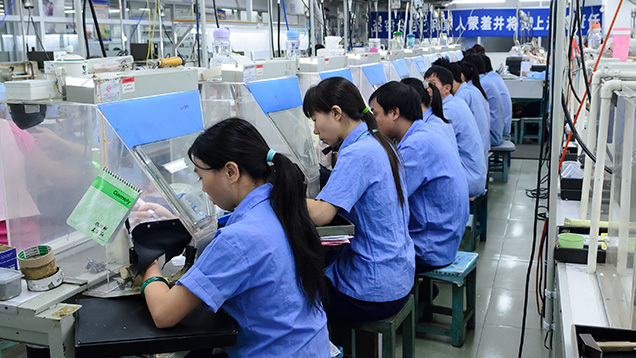 While continually increasing its manufacturing efficiency and product quality, the company also invests in developing its jewelry design team. 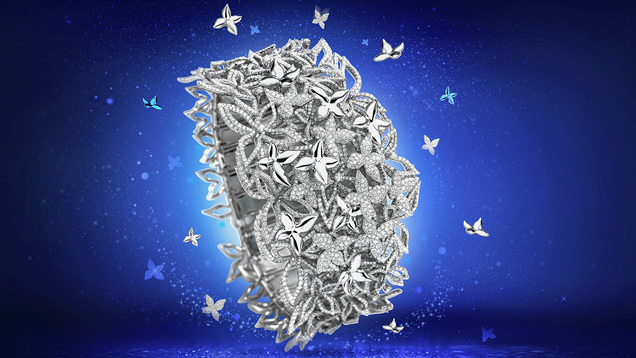 Through the years, Xingguangda has won numerous awards in the National Jewelry Design and Manufacture competition. 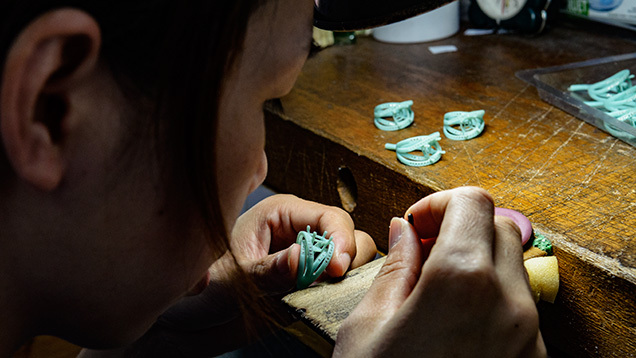 In the most recent 2014-2015 competition, several jewelry-making technicians from the company won individual awards. Besides its dealings in colored stone jewelry, Xingguangda also collaborates with diamond-cutting factories to research new creative cuts. In 2014, they launched a new diamond cut called “ten heart and ten arrows.” This new cut has 71 facets—more than a regular round brilliant, which has 58. The manufacturer reports that this cut’s fire is generally 20 percent stronger than regular round brilliants. Only one out of 300 pieces of rough is suitable for faceting this new cut and it takes six times longer to produce than the round brilliant. Lorenzo Jewelry (LJ) International Inc. is the parent company to a wholesale business, called Lorenzo, and a retail jewelry brand called Enzo. The company is vertically integrated, with mining interests, direct purchases from mines, colored gemstone manufacturing, jewelry design and manufacturing, global wholesale distribution, and retail sales. LJ International keeps its retail and wholesale businesses separate by selling wholesale to markets globally and selling retail through its stores in China. The establishment of the Enzo retail division in Mainland China completed LJ International’s full mine-to-market value chain. Photo by Andrew Lucas/GIA, courtesy LJ International. The company can trace its origins back to February, 1987, when the current company Chairman, President, and CEO, Yu Chuan Yih, founded Lorenzo Jewelry Manufacturing in Hong Kong. Mr. Yih was born in Brazil and started in the industry as a Brazilian gemstone trader. The company’s origin was very humble, with just five workers in the original colored stone cutting factory. Their first entry into China was in 1990, when they opened a 45,000 square foot colored gemstone cutting factory in Shantou, China. In 1998, they also opened a 50,000 square foot factory in Shenzhen. By 2003, they consolidated the operations into a 100,000 square foot highly modern Shenzhen facility. There, they cut colored gemstones, designed and manufactured jewelry, and conducted all their trading and corporate affairs. 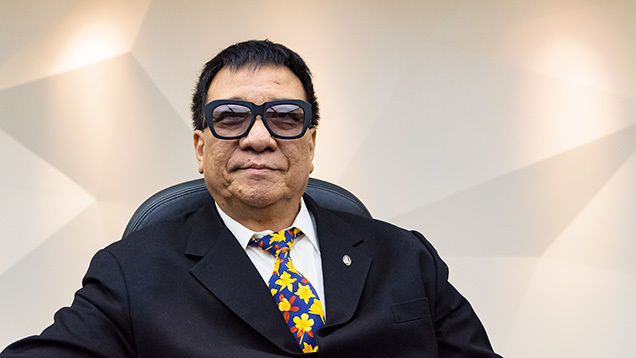 Company founder Yu Chuan Yih has come a long way from dealing colored stones in Brazil to leading this completely vertically integrated company. Photo by Andrew Lucas/GIA, courtesy LJ International. Their major wholesale markets include the USA, Europe, and Japan, with 70 percent of their sales in the USA. They sell to many major companies, including QVC, Ben Bridge, Sterling, Helzberg Diamonds, Macy’s, Walmart, JC Penney, Signet, and Rhein Studios. Their lines include sterling silver, various karat gold alloys, a variety of colored gemstones, diamonds, and cultured pearls, as well as synthetic and imitation gemstones. 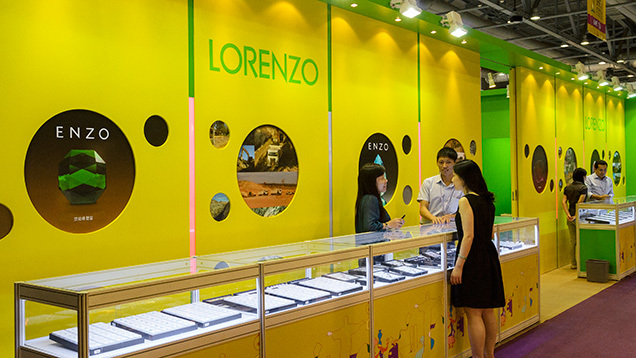 At the Hong Kong Gem and Jewellery Fair, the Lorenzo wholesale division sells loose colored stones and colored stone jewelry to buyers from around the world. Photo by Andrew Lucas/GIA, courtesy LJ International. The first Enzo retail store opened in Shanghai in December, 2004. Today, Enzo has around 250 stores throughout Greater China, including mainland China, Hong Kong, and Macau. 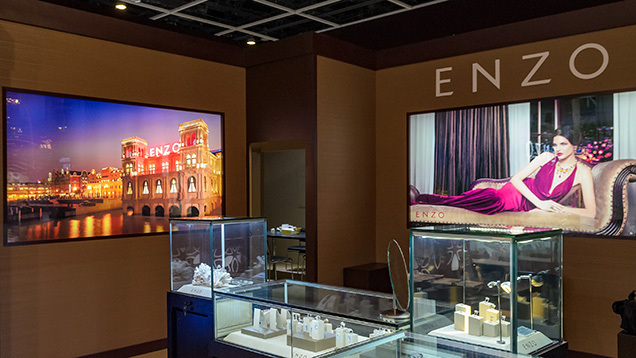 Enzo has two divisions: the Enzo chain of retail stores and Enzo Ouro, a new retail concept that serves super VIP clients with high-end jewelry by appointment. The first Enzo Ouro store opened in Beijing in 2014. 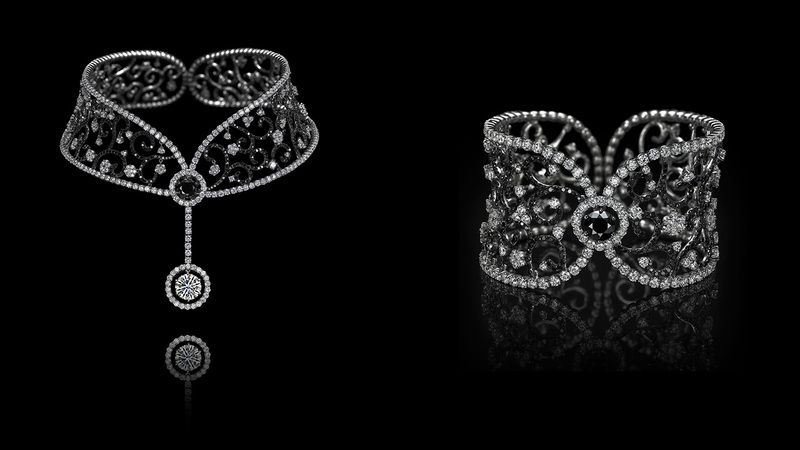 Prices for Enzo Ouro jewelry range from US$12,500 into the millions. Enzo Ouro stores and showrooms exude luxury and exclusivity. Photo by Andrew Lucas/GIA, courtesy LJ International. 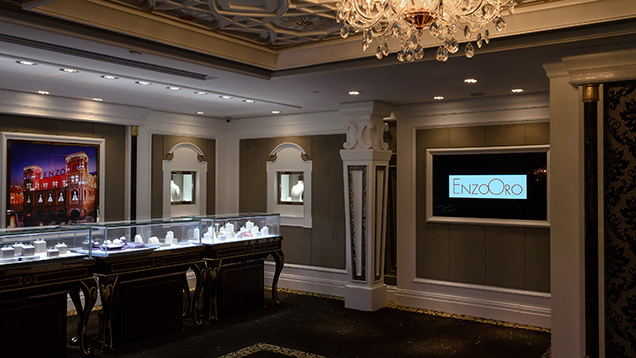 While known for loose colored gemstones and colored gemstone jewelry, Enzo also has diamond lines that target the important wedding market in China, which sees over 13 million marriages annually. 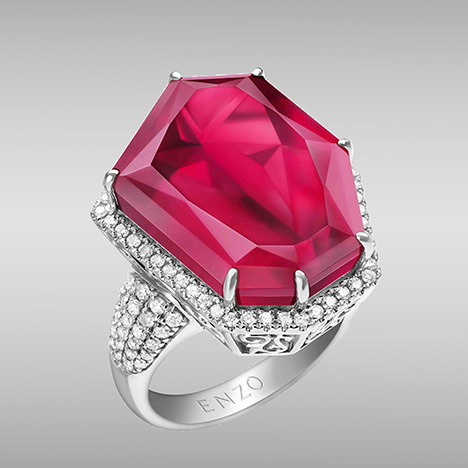 Enzo breaks its diamond line into three price-point ranges, with different diamond qualities in each. Highest is Enzo 88, then Snowy, and then Cape. Enzo 88 has D to H color, Snowy has G to J color, and Cape has K through M color. 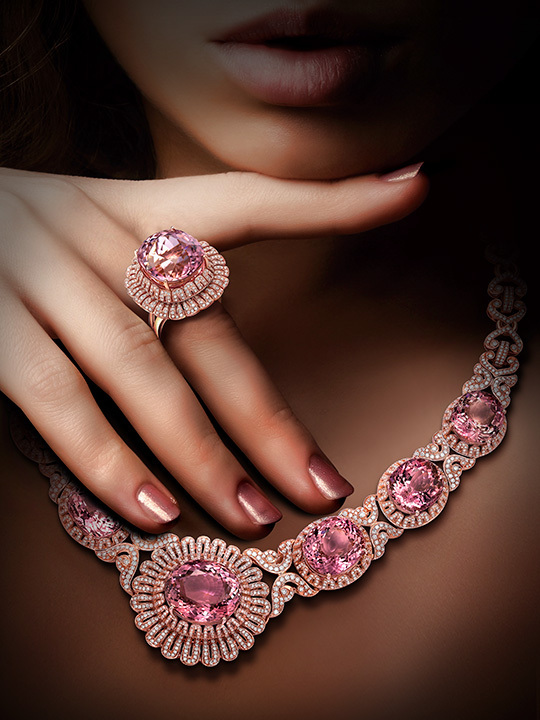 The Cape line has the largest market share of diamond jewelry for Enzo. GIA visited LJ International’s corporate headquarters in Shenzhen to observe their manufacturing process. Lorenzo cuts over 100 types of colored gemstones in their facility. In the warehouse, rough is kept in 25-kilo bags, with more-expensive varieties like tourmaline stored in a walk-in vault. Lorenzo primarily cuts colored gemstones other than ruby, sapphire, and emerald, preferring to buy those stones already cut for use in their finished jewelry. chain. 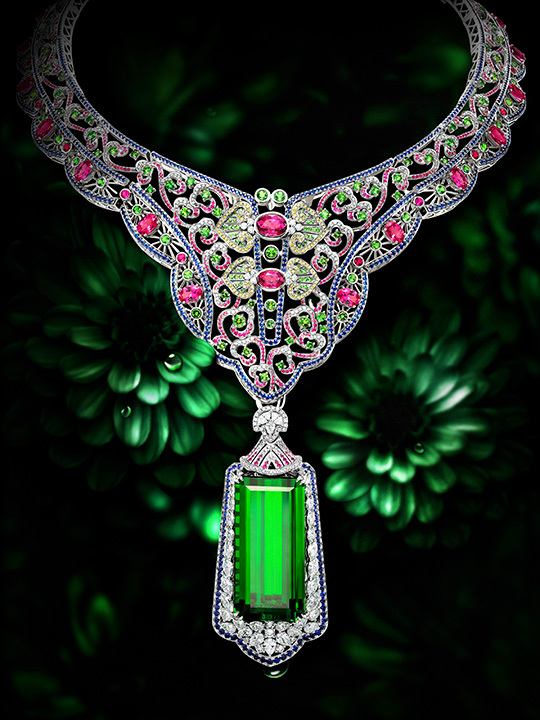 Photo courtesy China Gems. Lorenzo sources its rough from mines that the company has interests in, from other mines, or from the open market. All rough goes first to their office in Hong Kong and is housed in their massive warehouse. Shenzhen is a free-trade zone, so having the factory there allows the rough coming through Hong Kong to be declared to Chinese Customs with stone type, weights, and values listed, then enter China through Shenzhen and come directly to the Lorenzo factory with no taxes or duties placed on it. Lorenzo has an agreement with customs declaring the typical expected amount of weight loss after cutting. The new weights are listed for loose or jewelry-set finished stones, which are exported back to their Hong Kong office for global distribution. 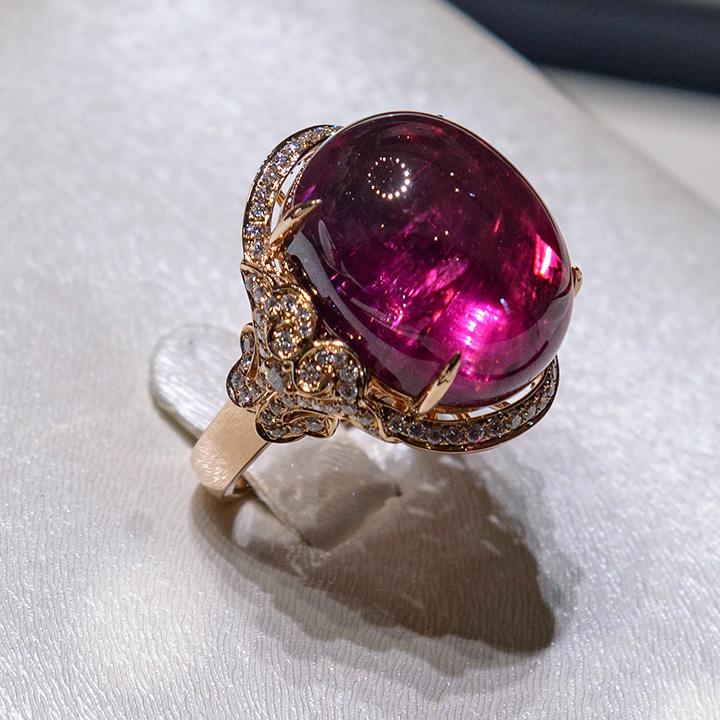 Copper-bearing tourmaline from Africa is one of the gem varieties that Lorenzo brings into Shenzhen. They cut the stones there for sale on the global market. Photo by Andrew Lucas/GIA, courtesy LJ International. This allows Lorenzo and other companies to smoothly import rough gemstones into China, cut them, set them into jewelry, and export them to the global market without paying import and export duties. Rough is brought in by the gram and kilo while cut stones are exported by carat weight and number of pieces. 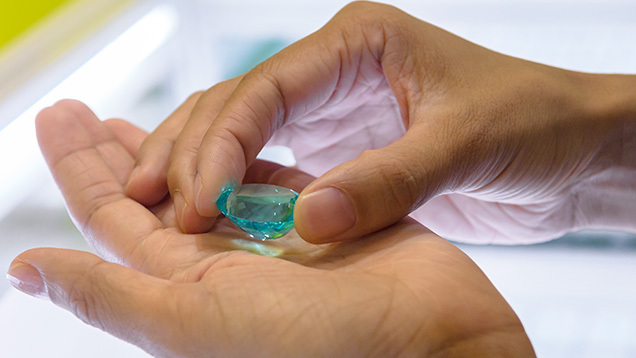 For gemstones destined for domestic retail sale in Enzo stores, the company must pay duties that depend on stone type and whether they’re rough or cut. Lorenzo has more than 100 types of stones in their inventory room, broken down into three categories by value: Platinum, Gold, and Silver. The Silver level includes agates and other less-expensive aggregate materials; Gold contains facet-grade material like amethyst, citrine, garnet, and blue topaz; and Platinum contains more-expensive facet-grade material like tourmaline (including copper-bearing), imperial topaz, pink topaz, kunzite, and morganite. Rough is sorted by color, shape, clarity, and size. Lorenzo uses color master sets as references, so customers can order material that is reliably consistent. Photo by Andrew Lucas/GIA, courtesy LJ International. Their sorting department uses rough masterstones to grade color. They have six color classifications for each type of gemstone. For example, the six color grades for citrine range from CS (citrine super excellent), CE (citrine excellent), and then C1, C2, C3, and C4. The rough’s final grade is based on color, shape, thickness, and clarity. At this point and after each manufacturing stage—sawing, preform, and faceting—the rough is also given a weight yield projection. If the weights after each stage are less than the projection, they review that manufacturing stage. The sawing, also called slicing, stations are set up so the sawing wheel is enclosed, with a viewing screen and an opening for the worker’s hands. This set-up, along with a face mask, vacuum tubes drawing gemstone dust away, and water applied to the rough, minimizes the worker’s exposure to the dust resulting from the sawing process. Most of Lorenzo’s workers who do the sawing and preforming have over 10 years of experience. Photo by Andrew Lucas/GIA, courtesy LJ International. After sawing, the preform stage uses a grinding wheel to shape the stone. The preform set-up is also designed to minimize workers’ exposure to gemstone dust. Workers wear masks, and a vacuum tube draws dust away at each grinding station. The set-up at the faceting stations uses two lapidaries: one for cutting and the other for polishing. While this system is not unique, the custom-built lapidary machines from Korea were set up in an arrangement designed for left-handed workers. The reason for this is the competitive nature of hiring skilled cutters in Shenzhen. Cutters are often hired away from one manufacturer to another. However, almost all two-lap cutting systems are designed for right-handed workers. By having left-handed machines, Lorenzo minimizes the hiring away of its cutters. Lorenzo cuts all their copper-bearing tourmaline in a separate section that encompasses all stages: rough sorting, sawing, preforming, and faceting. This confinement to one area makes it possible to secure the expensive material. Lorenzo uses a two-lap faceting system. The lap on the left is for cutting and the one on the right is for polishing. Photo by Andrew Lucas/GIA, courtesy LJ International. 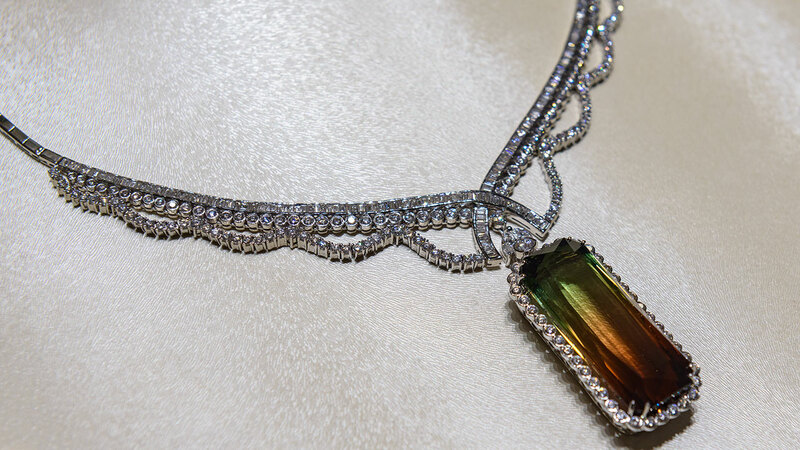 Lorenzo’s operation covers the entire value chain, from buying and cutting rough colored gemstones to mounting them in jewelry. They also have a wholesale export business and domestic retail stores. 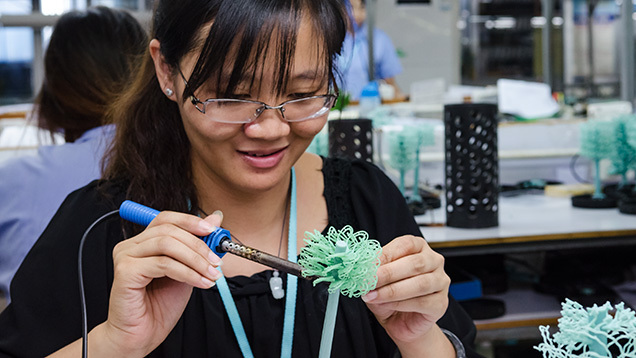 Our tour through LJ International’s multi-story Shenzhen headquarters took us into their jewelry design and manufacturing facilities. 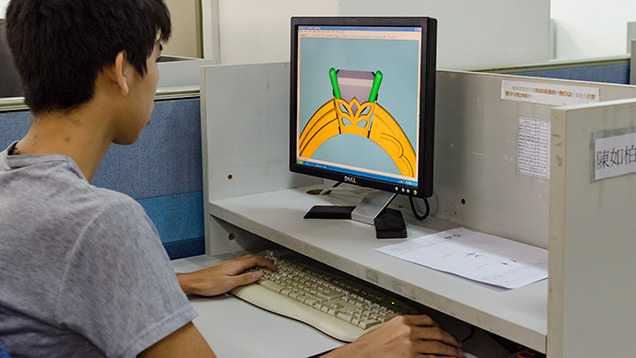 Their designs start out as hand renderings that are scanned and cleaned up with Microsoft Paint before moving on to the CAD/CAM division. The digital design file is sent to a Fast Prototyping Machine that creates the first wax model through a laser printing process that takes six hours. The wax form is then cast in silver to make a master model. Lorenzo reports that they have approximately 120,000 metal master models on hand. The entire production facility was well organized, modern, and clean, and emphasized worker safety and health. Photo by Andrew Lucas/GIA, courtesy LJ International. At the jewelry-design stage, the model-production process starts with converting a hand drawing into a computer file. The file is then sent to a machine that creates a prototype. Photo by Andrew Lucas/GIA, LJ International. This worker is attaching wax forms to a tree so several pieces can be cast at the same time. Photo by Andrew Lucas/GIA, courtesy LJ International. Intricate stone setting is performed with the assistance of a microscope. Photo by Andrew Lucas/GIA, courtesy LJ International. 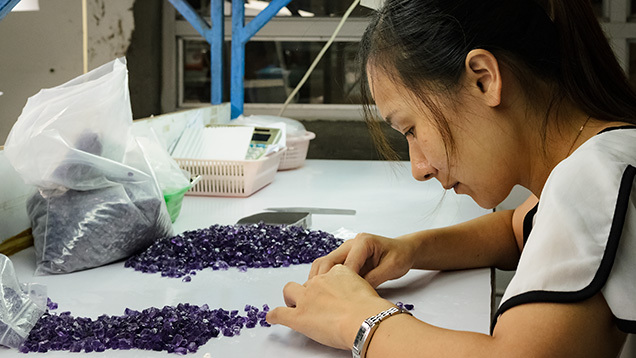 Lorenzo’s mass-production areas start with stone sorting, quality control, and stone matching for jewelry. 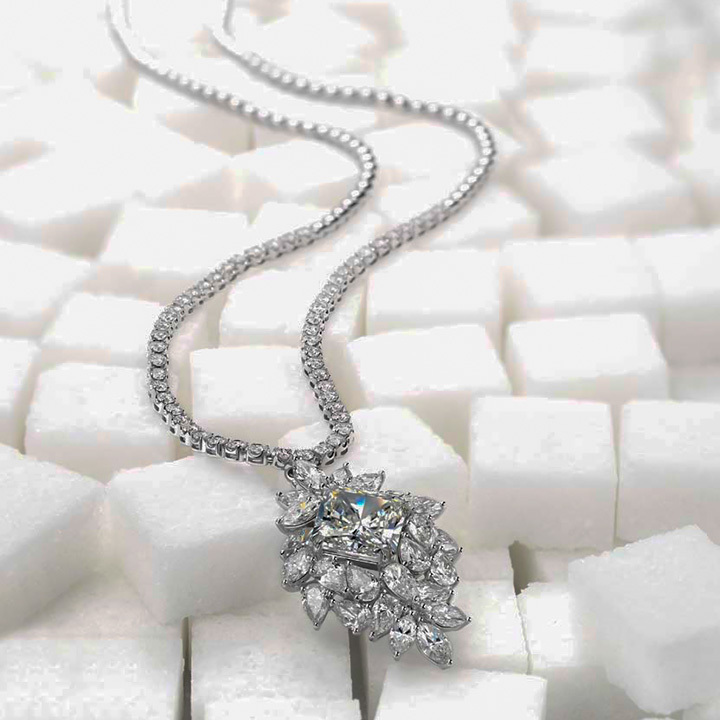 Their diamond melee sorters move at an amazing speed, louping a stone about every second. Colored stones are matched to master sets so customers can confidently order additional material in the future and know they will receive the same consistent qualities. Cut stones are graded against a master set, quality-inspected, and matched for jewelry. Photo by Andrew Lucas/GIA, courtesy LJ International. The production process involves selecting the mold needed from the company’s rubber mold library and then moving through wax injection, removing the wax from the rubber mold, preparing the wax for casting, casting the piece, preparing the jewelry for stone setting, setting the stones, final polish, and final quality control. Some casting is done with stones like diamond, sapphire, and ruby already set in the wax. Diamonds will be placed in this wax model to be cast in place, eliminating the need for a gem-setting step. Photo by Andrew Lucas/GIA, courtesy LJ International. Step inside Lorenzo’s massive gem vault and learn the intricacies of import and export for gem materials in China as well as How Lorenzo clasifies and stores their gem material. Our visit to Shenzhen, with stops at the Shuibei International Jewelry Trade Center, The Royalland Jewelry Club, Batar Jewelry, Xingguangda Jewelry, and LJ International, provided us with an important overview of that modern, bustling city’s dynamic jewelry industry. Because of the vertically integrated nature of its businesses, we also gained important information about the general structure of the Chinese gem and jewelry industry. Dr. Tao Hsu is Technical Editor of Gems & Gemology. Andrew Lucas is Manager of Field Gemology for Content Strategy at GIA in Carlsbad. The authors want to thank Mr. Wilson Yun, ex-president of the ICA, for introducing us to local industry leaders. We also highly appreciate the assistance from Sally Xiong and Yang Cao from Batar Jewelry, Yan Zhou, and Changwei Lin from Xingguangda Jewelry and LJ International. Founded in 2002 as an online bridal jewelry retailer, Zbird has become one of China’s most successful brands. 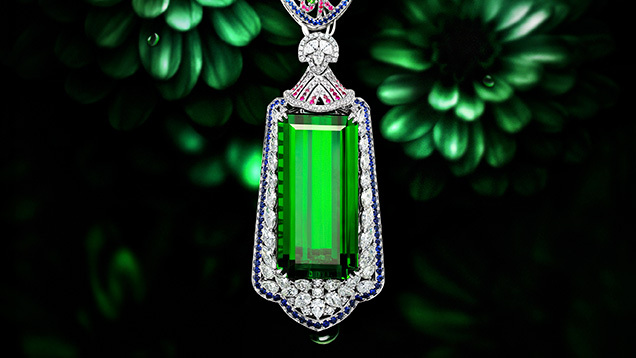 Chinese designer Kaka Zhang reveals the artistic inspirations and business strategy behind her jadeite jewelry. 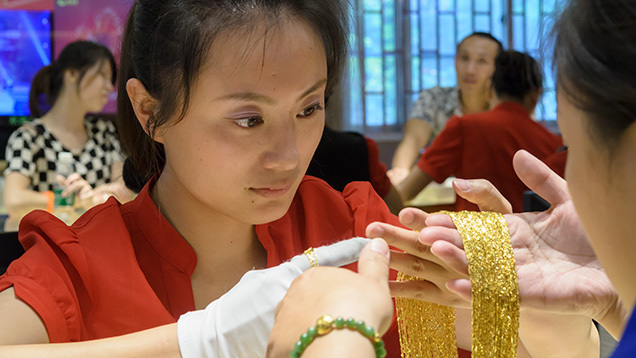 Behind the scenes at what's widely considered to be China’s largest jewelry retailer. An interview with jewelry designer Yue-Yo Wang to understand her traditional Chinese style. Shirley Zhang talks about her inspirations, background, and rise to success.